A semi-closed rebreather is a system where a part of the gas is reused by the diver. Gas is constantly added resulting in a redundant gas volume that is dumped through a overpressure valve. 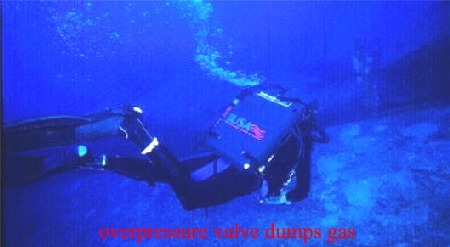 When we dive an oxygen rebreather one of the limiting factors of the system is the diving depth. Oxygen becomes toxic when it is inhaled at 1,6 bar. When we breath pure oxygen this is the situation when we are at 6 meters of depth. When we want to dive deeper we need to dilute the gas. Most common is to do this by adding nitrogen. The gas mix we breath then is better known as Nitrox. In a semiclosed rebreather (SCR) the gas addition commonly is constant. A system with constant gas addition we call "a active gas addition system". 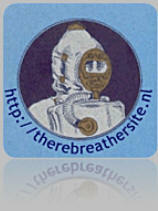 Since the diver only uses the oxygen the surplus nitrogen is vented through the overpressure valve on the counterlung. 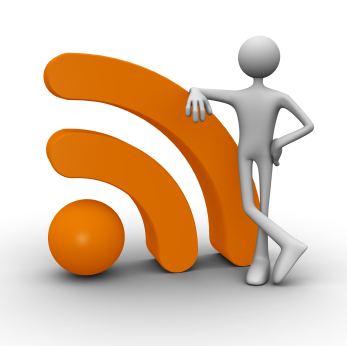 Exact dating of the first SCR is not known. It is however known that the first model for sports divers became available in the 90's. One of the first SCR from the Dräger company was known as the Atlantis, After the Atlantis a improved version was named the Dolphin. 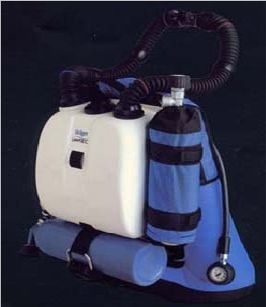 The cost price for a Dolphin apparatus was approx 3400 euro in 1996. After this introduction, SCR diving became more and more popular. In the 90's electronic closed circuit rebreathers where extremely expensive and most rebreather sports divers dived a Dolphin. 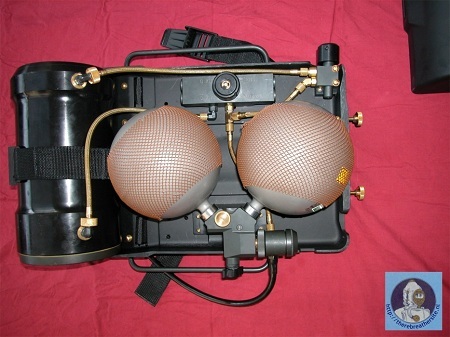 In Japan the Fieno rebreather was introduced and a large number of these units where sold world wide. Oxygen enriched air induces a lower nitrogen rate in the blood. The advantage of diving with Nitrox over OC diving is mainly to be found in the recycling of the gas, by partially re-using it. Dive depths, dive tables and nitrogen rates are identical to the normal Nitrox diving here. Re-using of gas means that a substantial smaller volume of gas needs to be carried. This implies that the construction of the diving set can be lighter and that a smaller gas container will be sufficient. Typically a SCR will be about 4 times more efficient compared to a open circuit diving system. Partial re-use of the gas is being explained in the fact that Nitrox (EANx=enriched air Nitrox of a certain composition) is constantly being injected. This happens via an injector with a permanent flow. When thinking of an injector you should think of a perforated piece of hard metal with an extreme precision that creates a constant flow. The injected gas of course contains nitrogen. Since the body does not use this gas in its system, it returns in the loop and has to be dumped to the outside of the system. 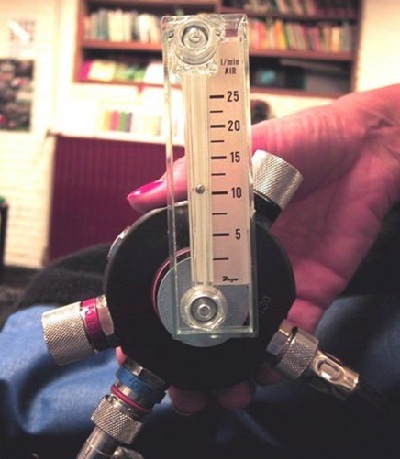 For this purpose, the counter lung has a overpressure valve. This valve that has a light working spring mechanism enables the gas to be dumped when there is over pressure. Because of this way of functioning this systems is being referred to as a semi-closed system. Gas injectors are used to add a gas flow with a precise volume (mass). By making the injectors interchangeable we are able to adapt the flow in relation to the composition of the injected gas. If a richer oxygen gas is being used, a smaller injection suffices since the human body has the exact same metabolic use at any depth. 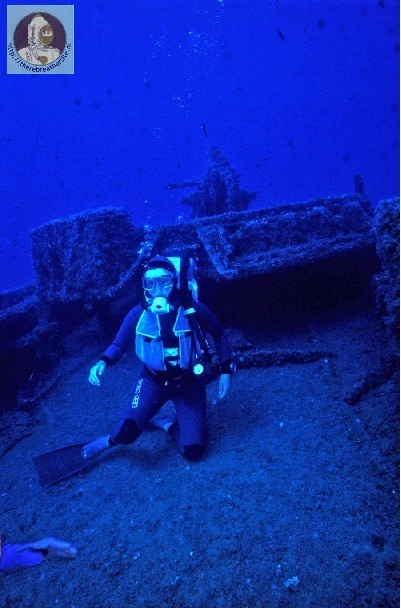 A Nitrox mixture of 60% oxygen enables a dive of 124 minutes to a depth of 17 meters. With a Nitrox mixture containing 40 % oxygen a 69 minutes dive to 30 meters can be made. In real life: Because the mixture is being recycled and its composition depends on a metabolic consumption, a dive with 40% Nitrox mixture will result in an inhaling of 33,62% oxygen. If we dive according to for example the Dutch Underwater Organisation (NOB) norms, a maximum partial pressure of 1,5 bar oxygen is allowed. In case we want to accomplish a dive to a maximum depth of 30 meters within decompression limits, we will calculate with EAN34, thus resulting in a maximum of 25 minutes dive time. In the section Calculations with a semi-closed rebreather we will further look at the way how the actual fraction is calculated.